In The Bakery we present an installation by Sharon Houkema (1975, Drachten). 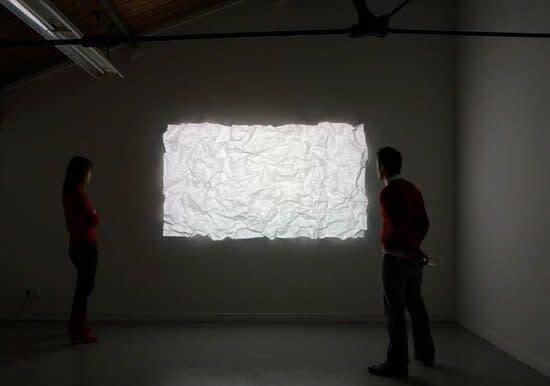 'Untitled' (2008) consists of a large sheet of crumpled paper on which an animation is projected. Slowly a path can be discerned through the landscape of the paper, which becomes only visible after taking a close look at the work. Sharon Houkema's work is characterised by apparently simple installations and drawings, which hold, however, a large concentration. Not the message but the process plays an important role. 'My works are lines and circles about movement, pattern recognition, the landscape and the path', says Sharon Houkema. The path that unfolds in 'Untitled' is literally a continuous movement through the landscape of the work of art.